Twenty-five years after the 1993 film, “Dave: The Musical“ makes its world premiere at Arena Stage. WASHINGTON — In 1993, Kevin Kline and Sigourney Weaver made us laugh with the White House comedy “Dave,” earning an Oscar nomination for Best Original Screenplay (Gary Ross). 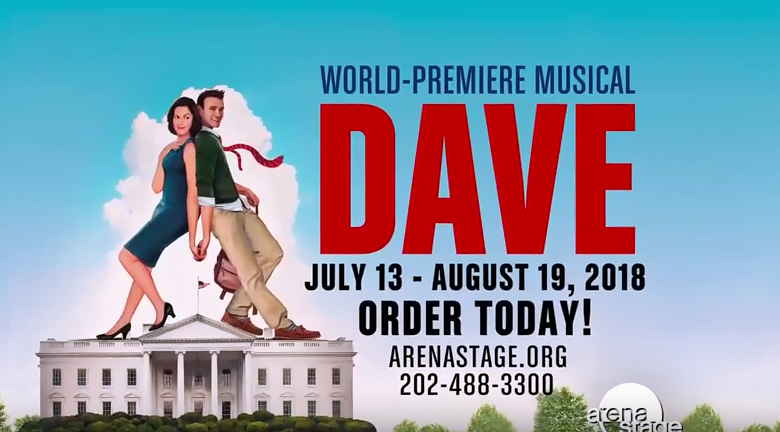 Now, you can celebrate the 25th anniversary with the brand-new stage adaptation “Dave: The Musical,” which makes its world premiere at Arena Stage in D.C. from July 18 through Aug. 19. Adapted by Nell Benjamin (“Legally Blonde,” “Mean Girls”), Thomas Meehan (“Annie,” “The Producers”) and Thomas Kitt (“Next to Normal”), the story follows affable temp agency owner Dave Kovic (Drew Gehling), who has an uncanny resemblance to the U.S. president. When the philandering president suffers a stroke and falls into a coma, the White House hopes to avoid a scandal by inserting Dave in the Oval Office, no doubt complicating things with the first lady. Sills, who plays Chief of Staff Bob Alexander, says originator Frank Langella has been curious. Parham’s role of communications director was performed by a man (Kevin Dunn) in the film. Of course, the biggest difference from the movie is that “Dave” is now a musical, a process that Benjamin knows well after adapting “Legally Blonde” and “Mean Girls” for the stage. The never-before-heard songbook includes “Mr. President” when Dave takes office; “A Whole New Man” about Dave wanting to change for the better; “The Last Time I Fake It” about the first lady’s estrangement from her cheating husband; “You’re Not My Problem” by the secret service; and “I’m Gonna Kill That Guy” about the chief of staff’s villainous plot to silence Dave. Of course, there are also challenges to putting on a brand-new musical. Will the uniquely Washington setting attract current lawmakers to check it out?